Posted 3 years ago on Monday, September 19th, 2016 by James S.
If you change the calipers or brake lines, you must get air out of the lines by bleeding the brakes afterwards. Otherwise, you’ll have a very squish brake pedal. I also try to bleed before every couple of track days, as brake fluid breaks down with heat. You know you need fresh fluid when your brake pedal gets soft. Fortunately, Miatas bleed very quickly compared to other cars. I’m going to note this a couple times, but wear gloves and eye protection while doing this procedure. 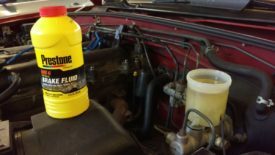 Brake fluid is extremely bad for you. When buying brake fluid, you can use one of the small bottles to just freshen up the fluid. If you removed a brake line or caliper, go ahead and get one of the big bottles or a couple of small bottles, since it’ll take longer to get all the air out. You want to bleed the brakes in a specific order. On a miata, it will be driver rear, passenger rear, passenger front, driver front. In most non-miata cars, it’s passenger rear, driver rear, passenger front, driver front. 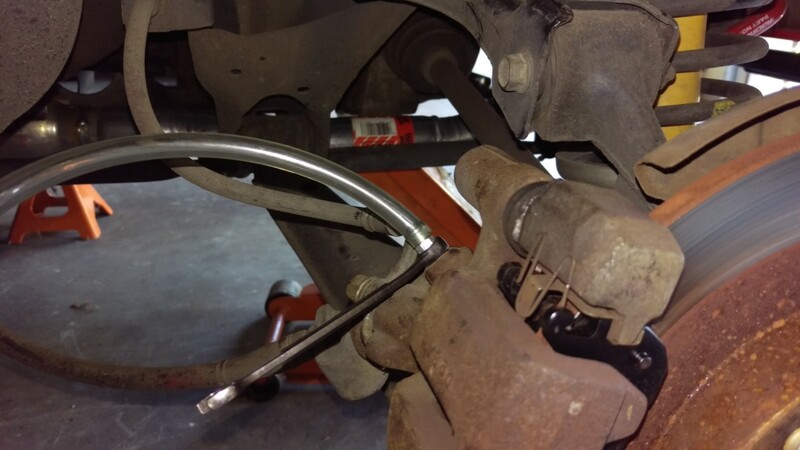 This is to bleed the brake line farthest from the master cylinder first. In a miata, because of the way the brake lines are routed, you do driver rear, then passenger rear, then the fronts. So go ahead and get the rear of the car in the air, with the wheels off. Uncap the master cylinder and get as much old fluid out as you can with a turkey baster or similar. Fill it to the brim with fresh fluid. You’ll keep topping it off as you go. You need an empty water bottle and some plastic tubing that fits tightly over your brake bleeder. 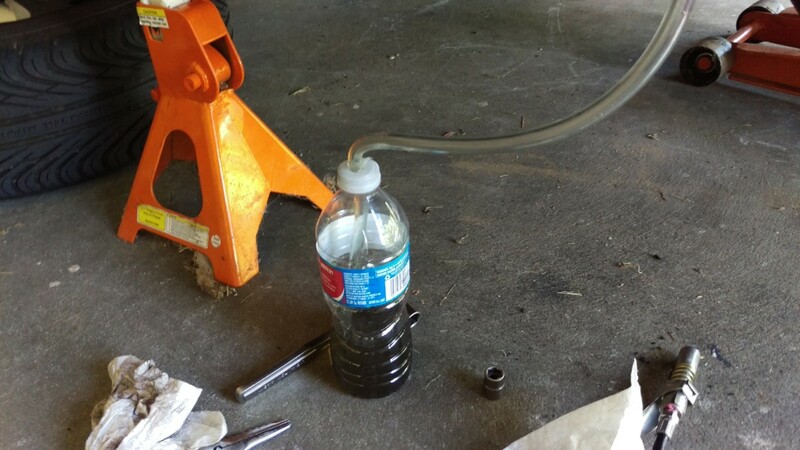 Drill a hole in the top of the bottle, fill it partially with some old brake fluid, and run the tubing into it as pictured. The old fluid at the bottom is to try to prevent sucking up air as you bleed it. Next, crack the bleeder loose with an 8mm box wrench. When you loosen this, brake fluid will flow. Don’t remove it or open it too much, just get it loose so you can easily loosen it in the next step, but keep it closed. I’ll note that some people say to use a flare wrench for this. You certainly can, but I don’t see a reason not to just use a box wrench in this circumstance, it grips even better. With that done, put the wrench on the bleeder and then slip your tubing over it. You’re now ready. As mentioned earlier, brake fluid is extremely bad for your skin and eyes. Wear gloves and eye protection while doing this procedure. It will also eat the paint on your car if you leave it sitting. Be sure to have a rag or paper towel to clean up any spills immediately with a rag. You need a helper in the car. Crack the bleeder open, tell the helper to press the brake pedal, then close the bleeder up, and finally, tell them to let up on the pedal. I find it easiest for the brake person to say “down”, the person behind the wheel pushes the pedal and says “down”, then brake person says “up”, and pedal person says “up”. Do this until you see fresh fluid coming through the tube. If you’ve got air in the lines, go until you get all of the air out. As you bleed it, be sure to top off the master cylinder. If the fluid level gets too low, you can introduce air and have to start all over. Do this through each corner, and you should have a nice firm brake pedal. Once you’ve got clean, bubble-free fluid coming out, you’re ready to move on to the next corner. As stated earlier, in a Miata bleed the rear driver side, rear passenger side, front passenger side, then front driver side, in that order. In most non-Miata cars, you will do the rear passenger side, rear driver side, front passenger side, and front driver side. You did not mention to bleed the brakes with the master cylinder cap back on!!! What a mess! Hi Tom, I actually bleed with the master cylinder cap off. It shouldn’t cause any mess, as you should only hit the brakes with the bleeder open – the excess fluid goes out the hose. Maybe you accidentally hit the brakes with the bleeder closed? Ah, I was trying to say “typically for not-miatas its passenger first, miatas are driver first”, but that does look confusing and the article IS “bleeding miata brakes”. I think the note about it at the end of the article was more clear. Thanks for the feedback, I’ll clean that up!